Once you’ve developed the ability to spot stories, the next habit is to actively notice them. Early in the 20th century biologists observed how animals, such as birds, learn how to notice a specific variety of prey and how they become extremely good at finding them. 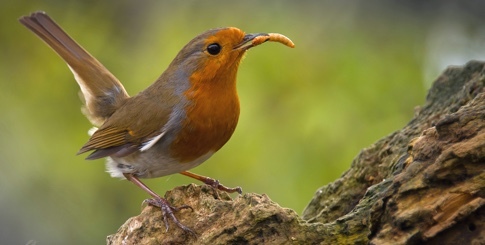 For example, a bird can detect a specific type of worm or beetle at a distance and when they do we just stand there amazed at how they found it. Biologists call this a search image. We need to develop our own search image for stories. The first thing to do is to keep an ear out for time markers. You’ll be surprised at just how many stories start this way and it’s a great way to start noticing stories around you. Then take yourself to places where stories are told. Head down to the cafeteria, visit your local restaurant or diner, join in on those pop-up corridor conversations or arrive early for a meeting to hear the general chit chat, or stay after the formal part ends to hear what happens. These informal parts of the meeting really matter. My friend Stuart French told me this story. A medical supplier that has its HQ in Australia has one of its offices in the US. The US guys felt on the outer because whenever they had a teleconference the communication equipment was only taken off mute when the proper part of the meeting started. They weren’t getting any of the chit chat. So Stuart suggested a small change in teleconference procedure. How about we let everyone hear the informal conversation at both ends of the meetings? It made a big difference, it brought their people closer together. So go to these informal places and just listen. Notice the type of stories being told. How long are they? What are they about? Who features? Who are the heroes and who are the villains? Now, notice how you respond to the stories. How do they make you feel? Do any give you a tingle of emotion? Keep a mental note of the stories that generate an emotion. These are the stories with power. This story created an immediate emotion for me when I read it. Steve Gass is an inventor and he’d been working on a safety brake for high-speed table saws that immediately stopped on contact with human flesh. With the saw spinning at 10,000 RPM it was time to test out his invention in a way that really mattered. Until now Steve had only tested his invention with human flesh stand-ins such as hot dog sausages. And each time he pushed the sausage at the saw blade it stopped without a scratch on the meat. But today was the real deal. He readied himself to push his left index finger into the whirring blade. When I read this story I knew immediately it was relatable because it sent shivers up my spine and set the hairs on my arm on end. I told it that night to my family and just by the looks on their faces I knew it had an impact. It was a good story, but to be a good business story it must have a point. Nearly any story can be turned into a business story. All you need to know is why you might tell it in a business context. In this case you might think that this story is about committing to an idea to bring it to life. Or perhaps it’s about the importance of doing something remarkable to get the attention of your audience, your customers, or your funders. The Australian Nobel laureate and doctor, Barry Marshall, had to drink an infectious beaker of bacteria to demonstrate that stomach ulcers were caused by a Helicobacter pylori bacterium rather than stress and spicy foods. That’s commitment and another good story. So as you discover stories it’s important to ask yourself the question, “what’s the point of this story and when might I tell it.” Once you work that out then you have a good business story on your hands. Way to point you finger, and still keep attached to your hand, at how to notice stories. I took 2 things away from this post. One, a better sense of noticing with the idea of search image. Two, the belief of putting something to the test while still being scared. I went to you link, I even liked that it did cut into his finger just 1/32nd of an inch. Shawn, you made my day with this post. How very true. A great reminder.